I wanted to use driftwood as a rustic frame to hold an encaustigraphic collage. “Love for Trees in Midwinter” is the result. I also incorporated polymer clay, stone and glass to make this quite an assemblage of colorful and natural materials. 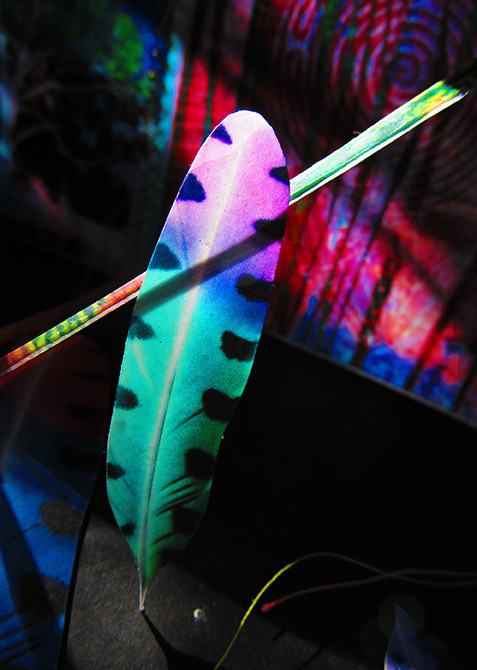 Feathers are one of the most popular forms I’ve made—people often ask, “Is this a real feather?” even though the colors are so wildly fantastical. 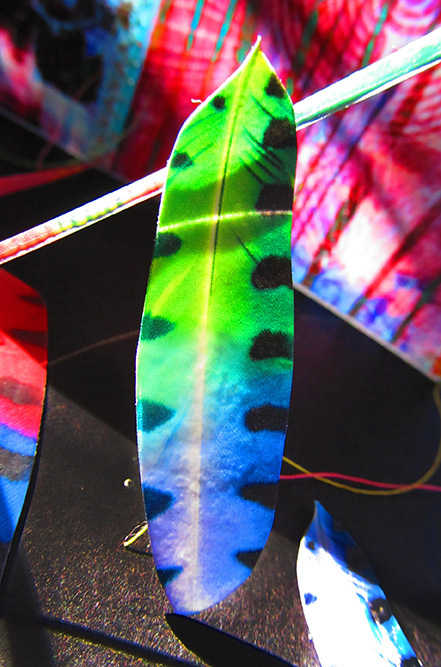 Real feathers are often problematic —not even legal to own in some cases— but with e-graphic feathers, you can make as many, in as many colors, as you like! Jewelry applications like earrings or hair ornaments are just two possible avenues for exploration, but I love simply hanging them in a window or from the branch of a plant (so lightweight!) to see the colors in the sun or gently moving in the breeze. The e*process creates material that has a surprising amount of strength and integrity on its own, as well as being easy to manipulate. 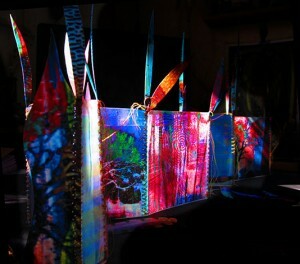 This accordion book, titled “The Beginning of Illumination,” is made of panels about 4″ square stitched on a sewing machine using regular thread. The feather forms at the top are bound on hardened copper wire “quills” inserted into the edge binding. 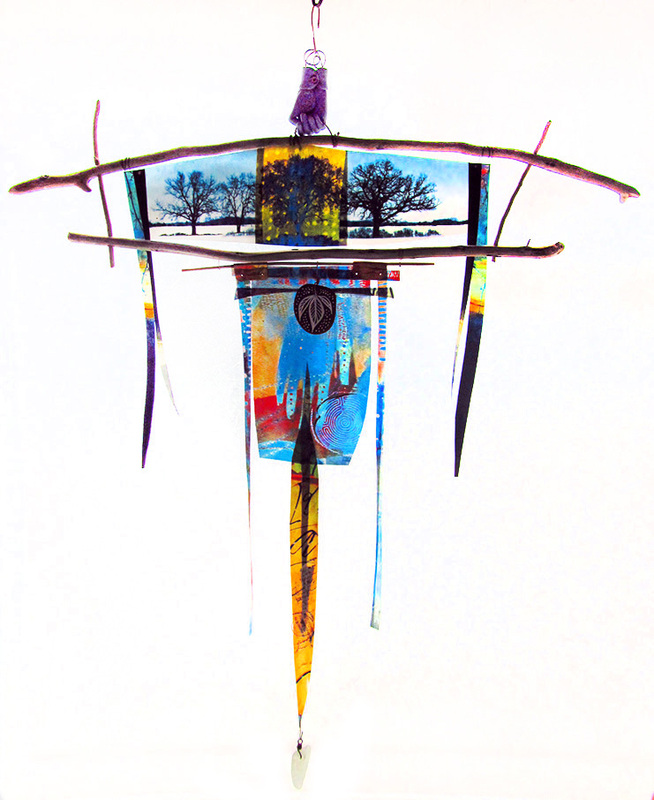 This was part of the Kalamazoo Book Arts Illustrated Accordion show in 2014. This encaustigraphic mandala leads off a suspension of playful pieces made from a variety of materials. The e*graphics process combines well with other materials, including beads, polymer clay (especially translucent varieties), driftwood, wire, and found objects. Although the main circle is 8″ in diameter, it is extremely lightweight and moves beautifully in the breeze.